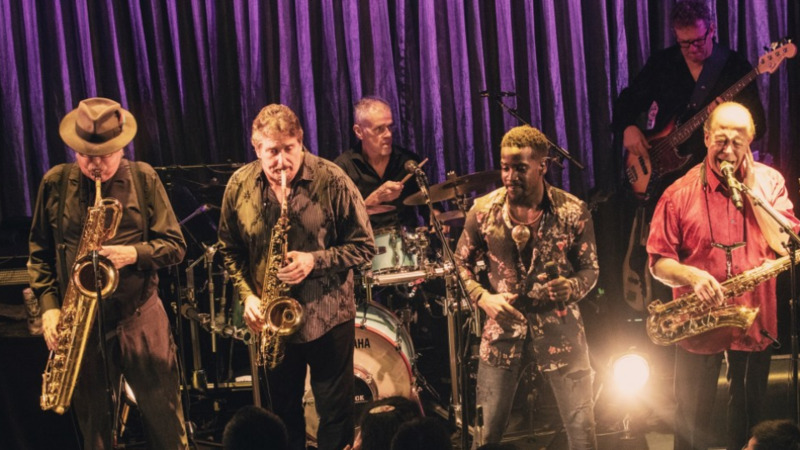 Tower of Power says life good at 50, even more music "in the wings"
"We've now played over a hundred nights in Japan" in the course of a five-decade career, says baritone sax player Stephen "Doc" Kupka, a co-founder of iconic soul band Tower of Power, which this week wrapped up the Japan leg of its worldwide 50th Anniversary Tour. The Oakland, California-based TOP also made clear the current tour is nowhere near a swan song and their next album release is "in the wings." 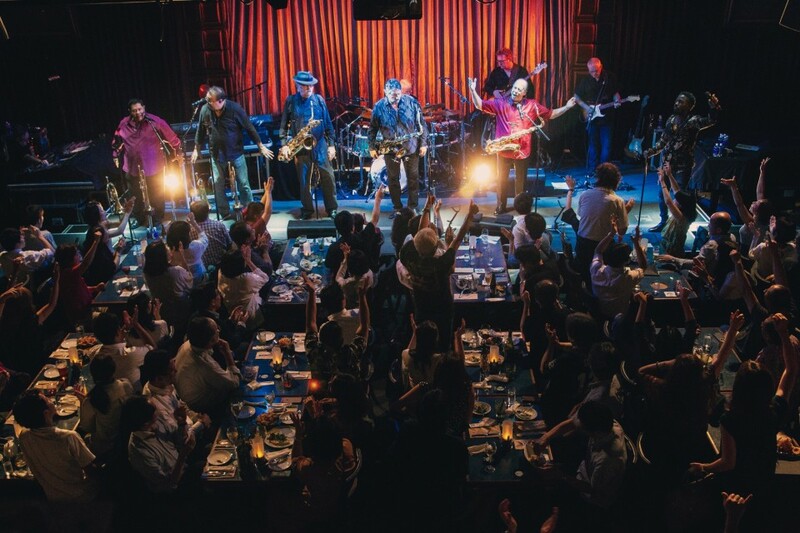 The 10-member band, known in particular for its horn section, recently played double-set dates at Blue Note Tokyo -- which is celebrating its 30th anniversary this year -- concluding with two final sets at Blue Note Nagoya. TOP is also touring in the wake of releasing the successful "Soul Side of Town," the band's 25th album and its first to reach No. 1 on the Billboard charts. "Soul Side" debuted in June at the top of the Billboard Jazz Albums and Contemporary Jazz Albums charts, and also made the Independent Albums and R&B/Hip-Hop Albums listings. The 1968-formed "East Bay Kings of Soul" drew on a variety of cuts from their extensive and still-growing catalog while playing to capacity crowds throughout their Japan stay. Three songs into the first-show performance in Tokyo, the band took a brief breather, allowing new lead vocalist Marcus Scott to ask the still-seated but enthusiastic crowd, "Are you having fun out there?" "I know there's a lot of chairs here and tables. No dance floor or anything like that. But it's OK. When you get done eating, you've got to promise us you're going to dance with us tonight," he said. After playing "On The Soul Side of Town" from TOP's latest album, second tenor sax man Emilio Castillo, the band's main spokesman and the other co-founder, told the audience, "We're so grateful to be back in Tokyo." "Let me just say that we do have this new album...it's called 'Soul Side of Town.' It took us quite a while to record because we actually recorded two albums. So we have 'Soul Side of Town' but we have this whole other album waiting in the wings to come out in about a year. So look for a brand-new TOP in your future." "And also, how many people came to Oakland to (our 50th Anniversary Celebration in June)?" the 67-year-old asked, pointing directly at a number of Japanese fans holding their hands high. "It was the party of the year," he told the crowd. "But I got to tell you, you get to party in your living room later. Because we filmed it in HD. We're preparing a DVD documentary for you. We'll have a two-disk set coming out. The DVD and the live CD. And (still pointing to Oakland attendees) she's gonna be in it. And you, and you, too!" The following day, Castillo told Kyodo News in an interview along with Kupka at Blue Note Tokyo, "I think we had more Japanese fans fly over (for the Oakland celebration) than any other country. People came from Australia, New Zealand. Some came from Europe, but I think the most that flew over were from Japan. One group (alone) was like 32." On still touring after 50 years, Kupka said, "We just make sure the music's good. And having a good road manager, that's very important...they have a hard job, corralling all the members and making sure the transportation and hotels and all that are lined up. So we're proud of the music and we do it well. And that helps from our end. But having good people with us handling all the details helps immensely." The 72-year-old added that at smaller clubs like Blue Note Tokyo, which seats roughly 300, there's an intimacy the larger halls lack. "But the drawback is we have to do two shows sometimes. And we're getting old now. Two shows roughs us up a little bit. But I love playing these clubs because the fans get a great experience, up close and personal." Castillo added that at this stage, TOP pretty much has its road game "down to a science." "We got the 10 (band) guys, and six (other) guys go with us. We've got a manager, a business manager, a booking agent, a travel agent, we've got a whole bunch of people behind the scenes that are just planning it out ahead of time." Still, he said the band takes nothing for granted and sets aside time each day to check in with a higher power. "We pray together as a band. And I'm not just talking about before the show we all get together and pray, we do that, but I mean we really pray for each other. So I mean even the crew, like our monitor guy...will come to me. His father-in-law was just ill and he actually passed away a few days ago. And he'll come and say would you pray for my wife, she's concerned about her dad, and you know I'll pray, and we all pray for each other. I think that just brings us so much closer." This time around, TOP also received anniversary surprises from Japan's Yamaha Corp., which makes the horns the band plays and endorses. Drummer David Garibaldi and keyboardist Roger Smith also play Yamaha instruments. "Two Yamaha elites came and brought us a big bottle of Moet champagne for our 50th anniversary with a special label on it, they had our picture on it, said 'Happy 50th' on it. There was also a huge flower arrangement (from the company) to celebrate our 50th," Castillo said. After Japan, TOP is scheduled to fly to the Philippines, to play at the 16,000-seat Araneta Coliseum on Sept. 7. From Nov. 29 to Dec. 2, the band will be in Hawaii for gigs in Honolulu at the Blue Note venue there. Castillo says, "We've done this our whole career...we can play any kind of venue. It can be a big concert, we know how to do that. It can be right up close and personal, we can do that as well."